[by Thomas Marra PhD; New Harbinger Publications – 2004] As if coping with feelings of depression or anxiety by themselves weren’t difficult enough, clinical research suggests that as many as 60 percent of depression sufferers concurrently experience some kind of anxiety disorder. If you are in this group, it is quite common to simultaneously experience profound loss of energy and initiative along with substantial stress and anxiety. Caught between the push and pull of these two conditions, you might find that neither is easy even to recognize, much less cope with. 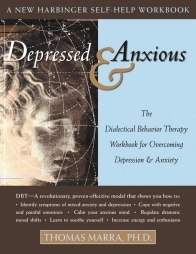 But, by adapting for the first time the powerful techniques of dialectical behavior therapy, or DBT, to the special needs of people troubled by co-occurring depression and anxiety, this book offers powerful tools for overcoming this condition. DBT is designed for people who have lost hope and meaningfulness in life, who question their own ability to be influential in their world, who find their emotions intolerable, and who find that they try to escape and avoid important aspects of their lives. DBT may be just the tool you’ve been looking for to move beyond depression and anxiety.